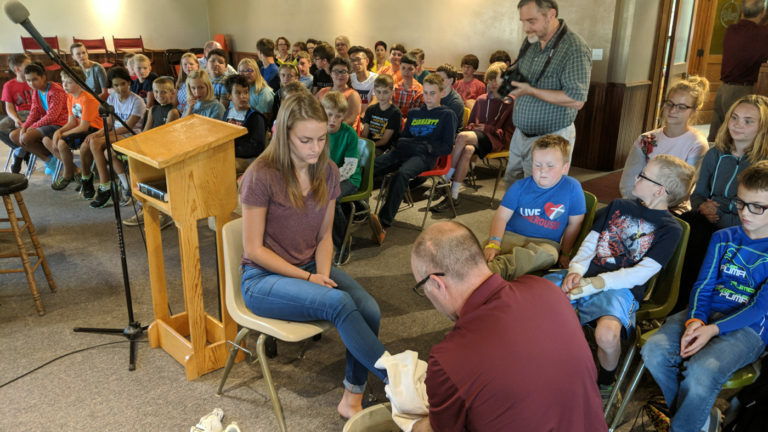 Portraying servant hood, head of school Nathan Epp washed the feet of senior Emily Heeg at the first chapel. Chapel was especially quiet. Students watched silently, wondering why Head of School Nathan Epp was taking off senior Emily Heeg’s shoes. Then he washed each foot. Silence continued. Kids in the back row shifted to get a better look. He had their attention. Epp went on to explain why Jesus washed the apostle’s feet in John 13. “In Jesus day, people walked long distances in sandals through dirt and dust. Subsequently, a servant would wash guests’ feet when they arrived at a friend’s home,” he said.